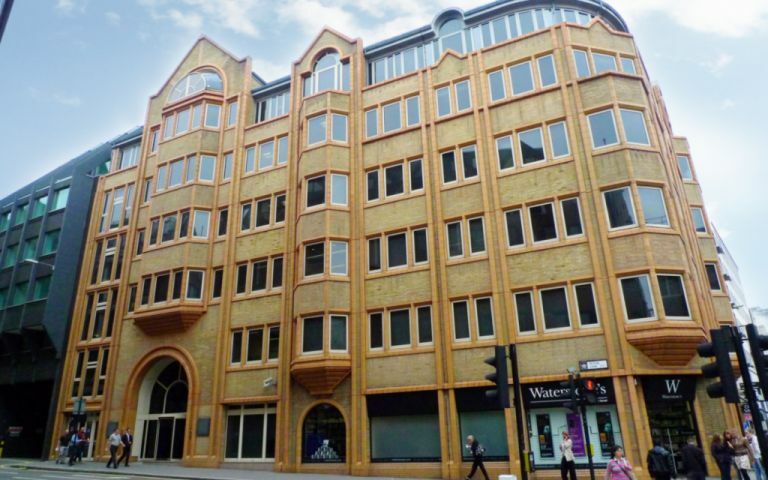 Located on Fetter Lane, adjacent to Fleet Street, these serviced offices have been refurbished to a high standard and feature a galleried manned reception. The area is very popular with legal companies given its close proximity to the Royal Courts of Justice. The offices now benefit from air conditioning, high speed broadband, furniture, 24 hour access and secretarial support should you require it. There are a range of meeting and conference rooms available that can be hired by the hour, half day or full day depending on your needs. Catering and audio-visual equipment can be arranged whilst Wi-Fi, plasma screens and stationery are included within the price. There are five tube stations within a fifteen minute walk giving access to four tube lines as well as Thameslink services from two stations. If you want to position yourself in the heart of London's legal district you couldn't pick a finer office location than here at Fetter Lane. Situated on the corner of Fleet Street and Fetter Lane, the office is only a short walk from Chancery Lane, Temple and London Blackfriars stations and provides access to the Central, Circle and District lines. City Thameslink is also just short walk away giving access to National Rail services and a direct link to Gatwick Airport. Easy Offices Where is the nearest place to get lunch near Fetter Lane? Easy Offices Where is the nearest car park to Fetter Lane? Easy Offices Where is the nearest public gym to Fetter Lane? Easy Offices Where is the nearest coffee shop to Fetter Lane?